Margaret writes to Jessie about her social life and recent trip to the theater. Monday will have to be my day for writing to you hereafter, because the choir sings so often now on Sunday nights that I have to go to church at night, and am too tired when I get home to write letters. I took lunch at the inn yesterday with Miss Luddington, whom I am simply daffy about. She is a perfectly exquisite creature. I hope that you are not tired any more, dear heart. My won't it be lovely when we are all together again! I do so wish that we could go to England again! I don't believe you do, do you? Miss Luddington wants us to take a house that she thinks is for rent in Lyme next door to Boxwood. The Bachelors are going to give a dance! I hope a nice one will take me. Mr MacDonald is going to take Tantchen.Mother's cold is worse (I suppose Aunt M told you she had one) and she is staying in bed to-day. She will not be able to go to Baltimore to Miss Bond as she had intended to. Too bad dearie. She had looked forward to seeing you with so much eagerness. I think however that it is wise for her to stay in bed, and I am sure she will be well soon. Saturday Mother and I went in to Philadelphia to see Midsummer's Night Dream. Annie Russel was perfectly charming as Puck. The whole thing was beautifully staged. The faeries instead of being dressed in stiff dazzling white wore soft draperies with moth like wings soft and wavy The colours were soft browns & greens & rose and dull red, according to the lights that were thrown on them. Puck and another fairly really flew! the scene where the fairies sing Titania to sleep was fascinating. Well dearest I would like to write a longer letter but have come to the end of my news. Give my love to the dear girls and keep love immeasurable for your sweet self. 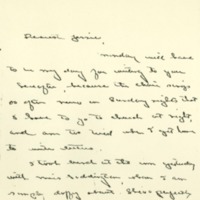 Wilson, Margaret Woodrow, 1886-1944, “Margaret Woodrow Wilson to Jessie Woodrow Wilson Sayre,” 1907 March 4, WWP17377, Jessie Wilson Sayre Correspondence, Woodrow Wilson Presidential Library & Museum, Staunton, Virginia.